The Gault, a lecture by Hilton Price 1879 - A small volume hard bound very rare. 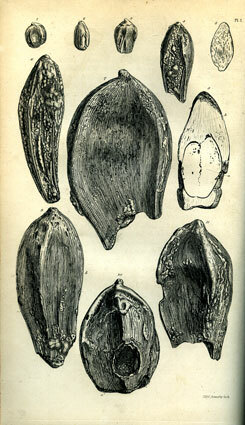 A History of the Fossil Fruits and Seeds of the London Clay by James Scott Bowerbank F.G.S. 1840, Incredibly rare. I have been told that there are probably only about 30 copies of this worldwide most being held in Museums & libraries. In need of some restoration to the front cover which has become detatched. I cant find any information about this book from antiquarian book sellers or palaeontologists so if anyone out there can supply me with better information than I have please contact me. 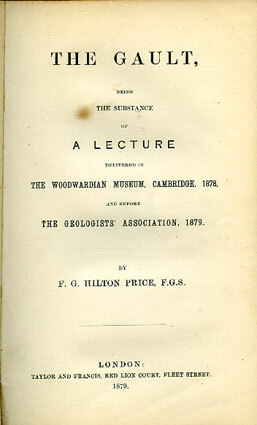 31 volumes of the Treatise on Invertebrate Paleontology 1979 reprint by the Geological Society of America, Inc And the University of Kansas Boulder Colorado and Lawrence, Kansas. A key to all the major orders and relevent species worldwide including all UK species. An Atlas of Fossil Chonchology of Great Britain and Ireland with descriptions of all the species by Captain Thomas Brown M.P.S 1889 re-issue. updated IdentificatType ammonites by S. S. Buckman volumes 1 - 7 in three hard bound volumes reprint 1972 with ions. Fish Otoliths from the English Eocene by Frederick Stinton 1975 - 1984 Parts 1 to 5 inclusive Hard bound. All parts of this Palaeontological society publication.